Hand #68: Bryn Kenney raised to 110,000 on the button, Pierre Neuville defended his big blind, and the flop was all clubs; . Neuville checked, Kenney fired out 115,000, and Neuville called. 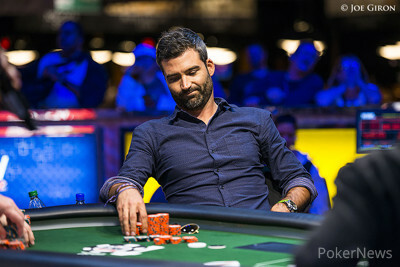 The turn was the , Neuville led out for 260,000, and Kenney snap-folded. Hand #69: Kenney raised to 105,000 from the cutoff, Neuville put in a three-bet to 265,000 from the small blind, and Kenney folded. Hand #70: Jeremy Kottler received a walk. Hand #71: Kenney received a walk. 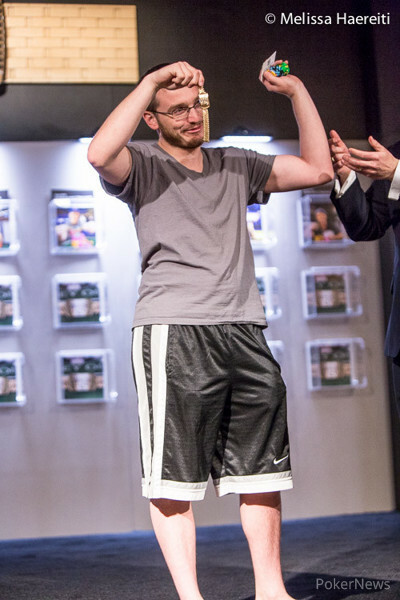 Hand #72: Kevin Eyster raised to 100,000 from the cutoff, Kottler moved all in on the button for 670,000, and Andrew Lichtenberger re-shoved for a little more out of the big blind. Eyster snap-folded. The flop gave Lichtenberger nine extra outs to make a ten-high straight, and he also had three outs to make a superior pair. The on the turn gave him said pair of aces, and the bricked off on the river. Lichtenberger's rail exploded into a chorus of cheers, while Kottler graciously shook all four players' hands before exiting. Kevin Eyster Wins Event #24: $5,000 Six-Handed No-Limit Hold'em ($622,998)! Pierre Neuville Eliminated in 2nd Place ($385,041); Kevin Eyster Wins! Eyster vs. Neuville for the Bracelet!